I caught this article from The Guardian that an author by the name of Raj Patel recently appeared on The Colbert Report touting his new book. Apparently, this shed some light on him and his background that happened to coincide with some prophecies of 87-year-old Scottish mystic Benjamin Creme. Creme's followers started hailing Patel as "Maitreya" -- their messiah. 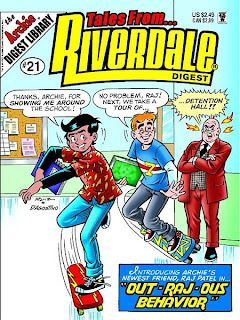 And while reading the whole article, I couldn't help but think: "But... but... Raj Patel is a ficitional character in Archie comics!" Yup. I read WAAAAAY too many comics. Raj Patel is being used as a mouthpiece for maitreya. Don't be fooled by any of these smooth talking liars.